Funny how decisions are made sometimes, and how unpredictable forces shape the way things turn out. 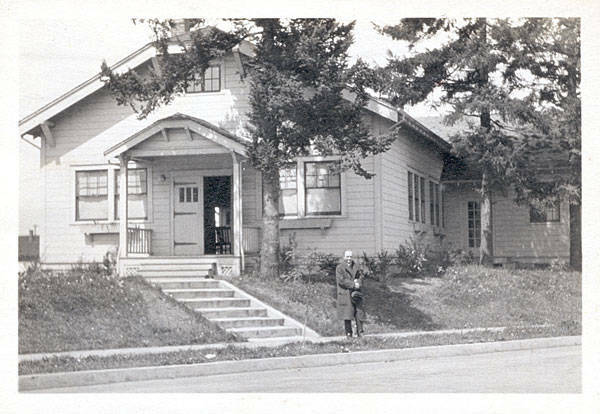 For 80 years, Alamedans have known the Alameda Park Community Church building– today’s Subud Center — as a friendly-looking building on an island just off Regents Drive at Mason. Passersby inclined to wonder about its history perhaps think it was a big house originally, or a community center. Potluck dinners, friendly gatherings, sing-alongs, dances, lectures, church services, meditation sessions: Yes, this building has seen it all. And this was the second hurtle the project had to overcome, after being relocated, before work really got underway, from its original and intended location one block west near the corner of NE 30th and Mason. According to the building records, and a handed-down memory from Bruce Morrison, the “little boy” who grew up in my house (who was 90 when I interviewed him), it didn’t take long for his dad Walter Morrison to make a fuss when the builder began site preparation on the lots next to ours. Yes, there was a significant amount of construction going on in “The Park,” as in Alameda Park, the early name of our neighborhood. 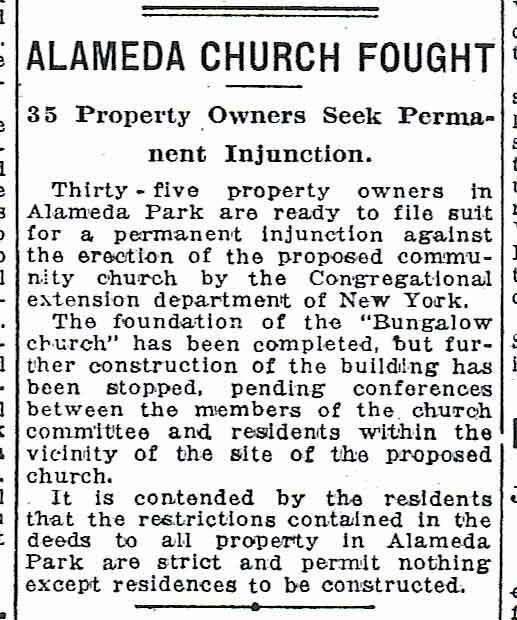 But when Walter found out the building adjacent to his house was going to be a church, he took his protest directly to the Bureau of Buildings downtown, and to the Alameda Land Company, which had promised to build nothing but homes in the area until 1929. 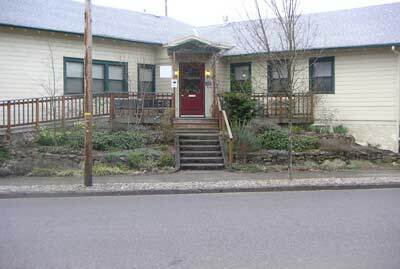 Like many other early homeowners in the area, the Morrisons purchased here because it was solely residential: No commercial or other buildings were permitted within the confines of Alameda Park. The Morrisons were church-going people…it seems that Edith and Walter just weren’t wild about the constant flow of traffic in front of their house. Sounds messy, doesn’t it? The developer got involved, and other property owners. I can imagine some tense meetings and feelings between neighbors. Not nice. Not only did they not want them building at 30th and Mason, they were ready to kick them out of the neighborhood altogether. It was, however, pretty neat to find this clipping, which confirms the handed-down memory from Bruce Morrison. Built at a total cost of $5,000, the church was actually a kit, constructed by the Redimade Building Company, and plumbed by Alaska Plumbing and Heating for the Congregational Church Building Society, headquartered in New York City. An additional wing of the building was added in 1924 by the Traverse-Bennett Construction Company. If you’ve read this far, you deserve a prize, so here are all the photos I’ve been able to find of the building. The Rev. 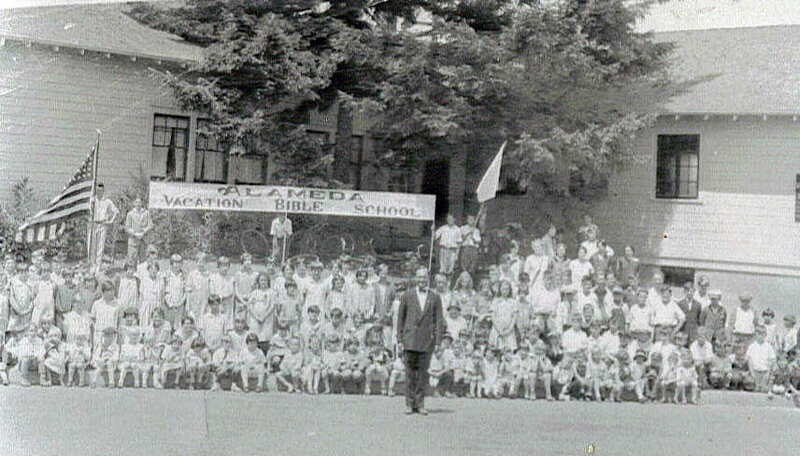 H.C. Johnson at the Alameda Park Community Church, undated. Courtesy of the Frank L. Moore Collection at the Amistad Research Center and Louisiana State University Digital Library. Alameda Park Community Church, 1923. Looking north, Regents Drive to the right and NE 31st Avenue to the left. Courtesy of the Frank L. Moore Collection at the Amistad Research Center and Louisiana State University Digital Library. 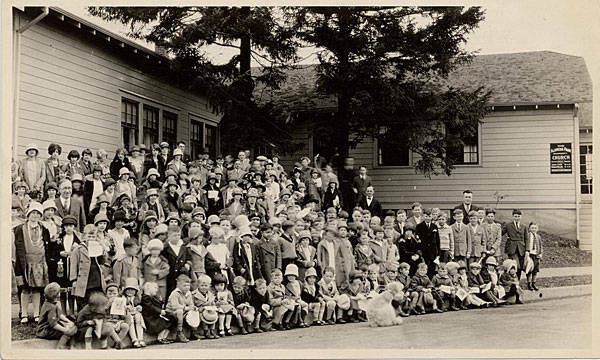 Alameda Park Community Church, 1930. Courtesy of the Frank L. Moore Collection at the Amistad Research Center and Louisiana State University Digital Library. 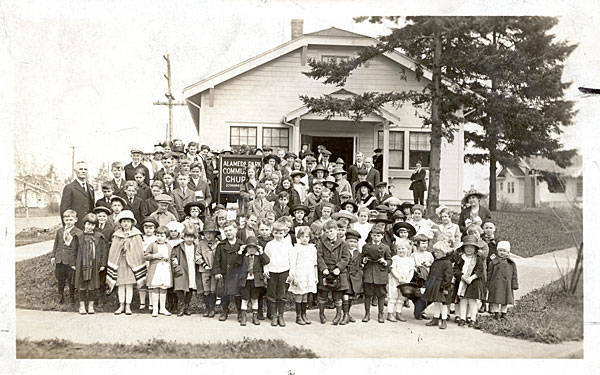 Alameda Park Community Church, summer 1924. The Rev. H.C. Johnson and the Vacation Bible School. Courtesy of the Morrison Family Collection. Do you know something more about the “Bungalow Church?” Drop us a note. Be sure to check out this more recent post we’ve written on “the rest of the story” focusing on what happened after the church opened. By the way, this wasn’t the end of neighborhood protests. Wait til you hear the one about the campground planned for 30th and Mason. Seriously! Thank so much. This is really interesting.